THE Syfy Channel kicks off the official start of summer with a four-day Memorial Day weekend marathon of nearly 40 movies, highlighted by the premiere of Wrong Turn, starring Eliza Dushku (Dollhouse, Tru Calling, Buffy the Vampire Slayer), on Saturday, May 29th @ 9:00 p.m. EST/PST. The festival begins on Friday, May 28th with “Cold as Ice” films, featuring Ice Spiders (Patrick Muldoon and Vanessa Williams) @ 5:00 p.m., Wyvern (Nick Chinlund) @ 7:00 p.m. and Yeti (Peter DeLuise) @ 9:oo p.m. On Saturday, May 29th, Syfy unleashes horror movies such as Open Graves (Mike Vogal) @ 3:00 p.m., and Wrong Turn 2 (Erica Leerhsen) @ 7:00 p.m., leading into Wrong Turn @ 9:00 p.m. The “Don’t Go in the Water” marathon on Sunday, May 30th showcases fan favorites from Mega Shark Vs. Giant Octopus (Debbie Gibson) @ 3:00 p.m., Lake Placid 2 (John Schneider, Cloris Leachman) @ 7:00 p.m. and Mega Piranha (Barry Williams, Tiffany, Paul Logan) @ 9:00 p.m. to Supergator (Kelly McGillis) @ 11:oo p.m. The holiday gala concludes on Memorial Day, May 31st, with a Stephen King movie marathon. Patricia Wetting and Dean Stockwell star in the two-part The Langoilers @ 11:oo a.m., followed by Rob Lowe, Gary Sinise and Molly Ringwald in the four-part The Stand @ 3:00 p.m. 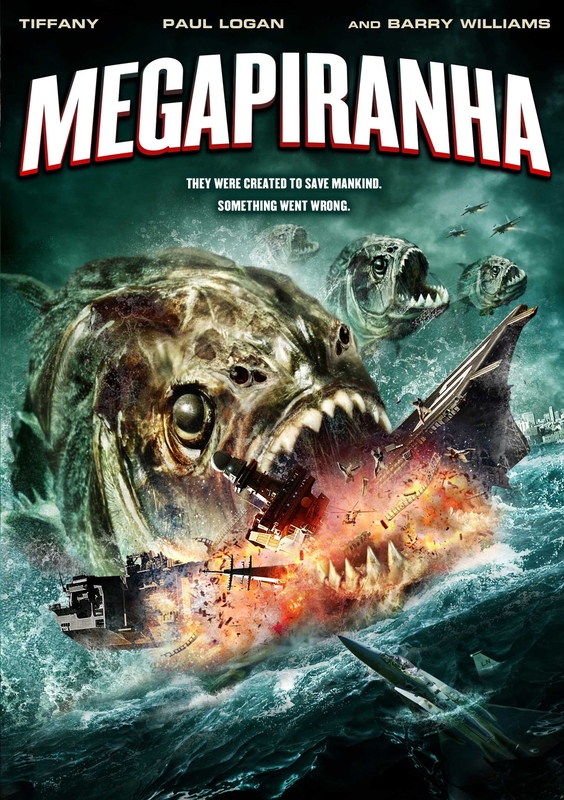 IN Mega Piranha, premiering on Saturday, April 10th @ 9:00 p.m. EST/PST on the Syfy Channel, Barry Williams (The Brady Bunch), 1980s singing sensation Tiffany and Paul Logan (Megafault) form an unusual alliance to stop a mutant strain of giant ferocious piranhas that have escaped from the Amazon and are eating their way to Florida. Produced by David Michael Latt, David Rimawi and Paul Bales. Directed and written by Eric Forsberg. As noted above, image courtesy and copyright of the Syfy Channel, so please no unauthorized copying or duplicating of any kind. Thanks!